I hope you are enjoying the fresh clean slate of a Monday morning with the promise of a great week ahead! I'm delighted to let you know that the recalcitrant Hammy has surfaced! He ran out of money in Abilene and had to ride freight on a train bound for Glory. Luckily, he was standing near the door when the engine hit a loose rail. As he tumbled down the embankment and landed on his Senses, he realized the Playhouse is all the adventure he needs! So I'm dashing in to post these cards and then I'm driving downtown to the bus station to pick up a tuckered-out hamster. It's a happy day for me and I'm wishing you a happy day, too! For this first card, I masked off my strip and then sponged my oceanic horizon with Distress Inks. The dolphins are from an ancient unmarked wooden stamp and the NBUS sediment is from PTI. I think it would make a great manly birthday card or just a great card to let someone know I was thinking of them. 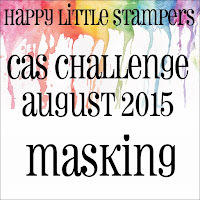 Happy Little Stampers CAS Challenge: Masking. One-Layer Simplicity Challenge: Strip Down. For this card, I stamped my image from Technique Tuesday's "R&R" and then masked the sides and watercolored the horizon. The NBUS sediment is from the same set. I am sending this one off to someone newly retired. City Crafter Challenge: Mood Board. Love these cards the colors are fabulous. I am a color gal. Glad Hammy is back. Love the watercoloring on both cards. Very pretty. Chuckling about that cartoon. Your blog is certainly interesting and entertaining. Thanks for cheering my day. Oh boy, you must be so excited to have Hammy back (and he to be back safely in the playhouse)! Love your beautifully colored cards! And the comic strip is hilarious! oh you are having quite the adventure. Great cards! Love the title...was laughing when I posted my card for the strip down challenge. Two beauties here...and love the cartoon! Your watercolou sponging is amazing! Love both cards, but my favourite is the first one, with these vibrant colours and the back dolphins. What a fun card! Thanks for sharing with us at CCCB! Love them both! Great job masking...actually a perfect job making! Have a great day! Wonderful cards Darnell, especially like the one with the ship. An amazing twofer. Your perfect masking make me drool. Certainly, know how to blend those colors...awesome. I smell a winner's chicken dinner. The dolphins are such a happy pair and look so carefree! What a great way to make some CAS cards that still look fantastic! I love them both. Two wonderful cards, Darnell. Lucky you--you were the very last card to sneak in at CASology this week before the link closed. Thanks so much for playing along. 2 super duper adorable cards Darnell! Fantastic masking on both, fabulous scenes and images. what perfectly wonderful cards and fun little cartoon. i love the dolphins, my daughter would love that card. A fab take on our moodboard and a beautiful card!Oh my this is stinkin'cute. Love that little girl with her board! Thank you so much for being with us at CCCB this week!Always good to have you with us! I'm loving the both of them! Same layout, yet different looks. The designs are so versatile, both age and gender neutral, I love that about a card. Two wonderful cards with fantastic masking! Love the dolphins and that ship looks like it headed right into my house. If it does get here hope it's a cruise so I can jump on. Two fabulous cards Darnell,your masking and ink blending is brilliant. I love how you used the same design with two completely different looks. Lovely stamp you used in the second one. Phew, bet you are glad to have Hammy home and hope he has learned his lesson, the grass is not greener on the other side! Two fabulous cards, as always, loving the fabulous colours in the strip, no not Las Vegas, on your cards. Great images too. Ha! Cute comic and two super sweet cards! Oh I love the dolphin card especially! What a fun technique. And the Fusco Brothers is always good for a laugh. I guess my life must be more interesting because my blog is neglected! I LOVE your blog. I always get to see wonderful cards and have a good giggle with you. It's just a delightful visit all the way around! Thanks for sharing your wonderful talents. those are both fantastic. love how you did the layers of colors in the strip and then stamped on/around. very pretty! Cute cards! I really like the one for Technique Tuesday! Sounds like Hammy has been very busy...even more than me! Enjoy your week. Nice to hear that Hammie is back...all safe & sound and where he belongs! A terrific twofer post! AWESOME inking on the dolphin card. I love the non-animated dolphin silhouette - adds a nice elegant touch to the perfect guy card! Your second card totally rocks the ship that it is showboating (how's that for a whole lot of nautical words in one sentence???). More AMAZING inking. Soooo cool to extend the yellow & blue beyond the image border. I'm calling WINNER, WINNER, CHICKEN DINNER on this beauty! Perfect strips, Darnell! Love all the color interest in those strips! Glad Hammy came to his senses! You've done well without him but I'm sure it hasn't been as much fun! So gorgeous! LOVING the colors and loving those dolphins on the first one!!!!!!!!! What amazing cards!! I LOVE the black dolphins against that colorful strip on the first card. I need to do this challenge!! Your second card is my favorite, though. I really like how you watercolored the water and the horizon. Just stunning!! Great job on all your masking!! Well, you certainly knew what to do when you took a mask... Wow! These are fabulous! Love the way you created those horizons and sunsets - so different, yet so perfect for both! I need to give this technique a go! Glad Hammy realised where the grass was really greener. A redundancy package will only get you so far! Thanks for brightening my day!! 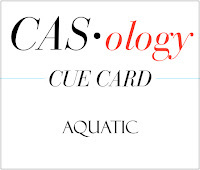 Oh, and thanks for having an aquatic adventure with us at CASology this week!! Last in the gallery but sure not least! I so love the dolphin silhouettes Darnell! 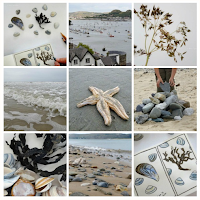 Beautiful card and so good to 'sea'you at CASology! Fabulous cards Darnell, particularly the second one - it is amazing. Funny thing is I think I have that dolphin stamp, unmarked wooden, given to me by a friend who was de-stashing! Hey Darnell!!! Both of your cards are amazing. Your did a great job on both. I was wondering if you where going to host another challenge? Thank you so much for playing us this week at CASology. Hammy may have come to his senses THIS time, but he's had a taste of the big, bad world. Don't be surprised if he goes missing again. Oh yes, great cards today, too. I'm always amazed at how pretty sponged inks can be. I need to do more of that. WOnderful cards ! I loved the masked and inked panel on both the cards n second one being my favorite ! Have a great week to ! Fabulous cards!! I'm so glad you were able to join us this week at CCCB!! And I'm glad Hammy came to his senses! Lol! Gorgeous masking - love the panels on both your cards! I am a fan of dolphins and love the way they are leaping out of your beautifully inked ocean. The way you have incorporated that ocean liner in to the masked strip is inspired too. Oooo, morje, delfini. Krasni sta. Hey Darnell, long time no see... no one to blame but my "shelf". Great summer looking cards. Despite the same type of masking, they are different and both beautiful. Happy day(s) for you too! Two fabulous masked and striped down cards Dolly! Thanks for playing along at Happy Little Stampers. So appreciate your support, my friend! Love both of these! Masking rocks! I hope Hammy has learned his lesson. There's no place like home! Both of your cards are perfect. The dolphin card would make anyone happy and bring a smile to their face. Retirement is an adventure so that is perfect too. Why that comic strip is just about the exact reasoning behind my blog! :P Your masked sky panels are GORGEOUS. Fab cards! Funny cartoon--made me laugh! Your 1 layer cards are terrific, Darnell! Love the design & beautiful inking! Beautiful masking and inking Darnell, love that ship stamp! Glad to hear of Hammy's return I hope he's not scarred by his experience! Has JC Duffy been reading your blog, Darnell? lol Love your stripped down cards and the wonderful vistas they provide. You have a happy day, too, my friend. I see lots of lovely inking. Great cards . .. I particularly like the ship one with that great sentiment. Wow! Both of these are fabulous and love how you masked off a strip and sponged in color creating a scene. It's brillant! 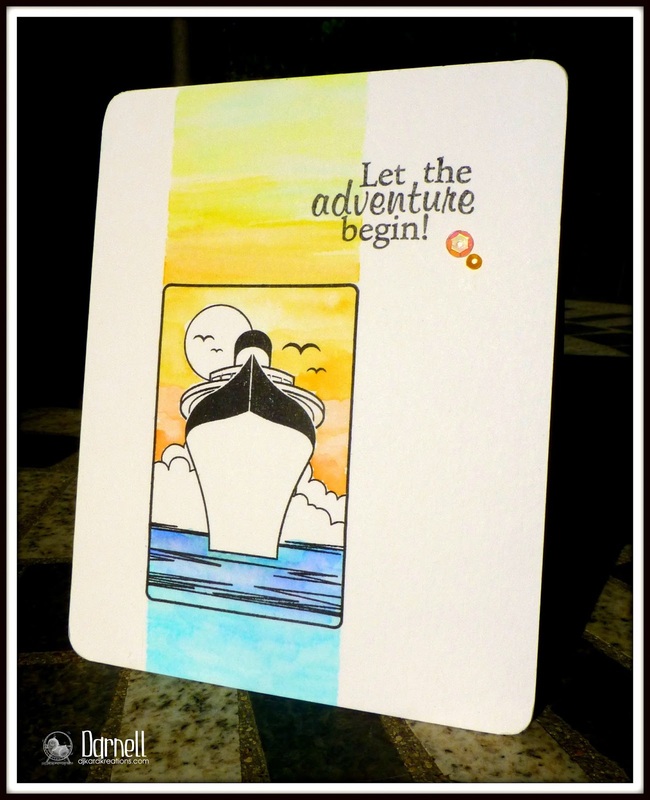 plus loving those dolphins and sentiment along with that ship and the watercoloring. So neat! I love the inking on the first card - I think that card could fit almost any occasion! And the second card - again, the inking is FABULOUS!! Love how you continued the sunset and water beyond the image itself! Both of these showcase your excellent talents at sponging and masking! Gorgeous background strips for the images on both of these!! Just so wonderfully done and I think you are a genius for the way you thought of these!! Hope you are having fun!! Two fabulous cards, Darnell. I especially love the way you've extended the sea and the sky on the second one. Gorgeous one layer cards & such beautiful colours. LOVE the masking and your two cards! WOW! We just watched Dolphin Tale 2 and your first card made me think of that! Ah... Dear hammy, glad he had enough money for the return journey.. Happy days. I love the masking on both, you've had a busy time with the masks, thanks for popping over. So glad to hear that Hammy is back safe and sound. He will certainly have some stories to tell I bet...... Both of your 'strips' are so beautifully blended and I love the black stamping on top. I must get organised and join in this challenge. I'm off to spend the weekend with my Mum tomorrow night, so hopefully I will get to makes loads of cards! Hammy should have been treated to a few blisters compliments of the shoe leather express. Ha! As for this type of masking, I love it! I recently purchased some Micro-Pore tape to do some masking myself. Great cards, Darnell. Both cards are wonderful Darnell. I do especially like that cruise ship! I wish I was on it, cocktail in hand, going to some place with palm trees and aQua aGua!!!! 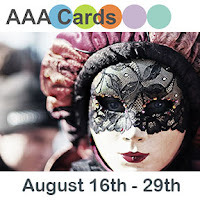 Thanks for linking up and playing with us at AAA Cards! So glad to hear that you're off the get Hammy to come home, Darnell!!! Would have loved to hear all the stories he has to tell!!! Both your cards are lovely - great sponging and watercolouring!!!! Love those beautiful dolphins and the image and sentiment on the retirement card!!! Two lovely one layers!!!! Your sponging is GORGEOUS!!!!! I LOVE those dolphins, and the image on the second one is pretty awesome as well. Well done! I love your funny!!! So which is it on your blog, accurate or interesting, or maybe interestingly accurate??? I love both of your cards, it always amazes me how beautiful a card can be with just a strip is all it takes to make is fabulous and you nailed it twice! 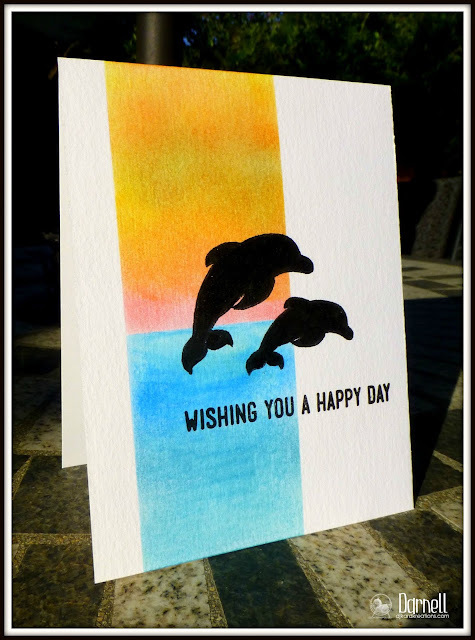 Love the Dolphin card - what's not to like with the clean lines of your cards! Great to know that Hammie finally realizes that home is where his heart is! Your stripped-down ocean-themed cards are gorgeous; in fact, so much so that you inspired me to give this sponging technique a try. After a few attempts, and a few cuss words, I managed to create two. Your creativity sparked mine; thanks for jump-starting a creative stretch! Again Great cards! (what else would I expect? Haha! Ooh, both fabulous, but I especially love the second one - great for a retiree!